We've begun a series of study exposing the lies of religious tradition. We are seeing the truth of the Gospel versus the lies of the spirit of religion. As we progress we will see more and more the benefit of losing the traditions of men and embracing God's over the top, too good to be true but true Good News Gospel of Grace. Today, I sense the leading to address this area of shame. What is shame? How do we define it in the context of exposing religious traditions? Shame is a painful sense of humiliation. It accompanies guilt and condemnation. Sometimes when we actually do something wrong afterward we are ashamed of our actions. Certainly, I understand no reasonable person wants to celebrate a poor choice or the act of hurting someone. Though that is true, shame is not God's method of bringing correction. In the context of religious tradition though, shame plays a major role. Under religion, shame comes to us whether we actually did something wrong or not. What I mean is this. Tradition has their rules and regulations and places a demand that you follow them. What they call preaching often is just the leader harping on the perceived notion of how little commitment the people have. How they are doing less and less and should be doing more and more. How they come short in their giving and church attendance. How the falter in spiritual disciplines. If we aren't beaten up a little, we don't feel like we've actually heard good preaching. When someone messes up shame comes from the enemy. He wants them to take that mistake and allow it to define them. The enemy wants them to allow it to derail them from fulfilling God's plan for their life. Tradition backs up the enemy's claims. I have heard horror stories of people made to come to the front of the church and recount their sin. You may say, brother, didn't Paul the Apostle of Grace teach us that we are to rebuke before all those that sin? Glad you brought that passage up. In full context, Paul isn't speaking of shaming people. He is speaking of leadership. In essence, he is saying don't entertain disgruntled people's claims. However, if in fact, a leader has indeed taken advantage of people and hurt those he leads, the behavior should be corrected and let the people know the behavior is wrong. God is offering guidelines to protect people. If a leader is scamming the people, taking their savings, or if they are physically taking advantage of them, he should be rebuked or corrected. Correction isn't about shaming someone. So this passage isn't talking about shaming the people every time they mess up. Under religion, shame creeps up to us subtly. Tradition will drop hints about how we are failing to measure up to their rules. They may mention things like watching the ball game instead of praying. They may speak of missing church meetings so you can visit family or participate in a prior engagement. They will challenge your "love for God." They will challenge your level of spiritual hunger or maturity. Then the people will do some heavy introspection. It isn't Spirit-led. It is religion led. It leads people to see themselves as continually failing to measure up. I read somewhere a great example of this. A person goes to church and they forgot to silence their cell phone. It rings, and the leadership stop and shame the person for disturbing the meeting. Not realizing the person was going through a tough time already, so they go to the local bar. There they are greeted by a warm smile from the bartender. After they are seated they mistakenly spill their drink. The waitress, says that's ok we all make mistakes, let me get you another drink. Another Bar worker cleans up the spill, saying again its no big deal. The person never went back to church, but always goes to the local bar. Look at your own life. In your own experiences with religion, how has shame played a part in your spiritual journey? Have you ever felt like an outcast? That your sin was too much for even God to handle? Did you feel you never measured up in the eyes of others? That they were always more spiritual than you, and therefore God favored them more? Did you ever feel like God would never answer your prayers because you are not as faithful and committed as others? 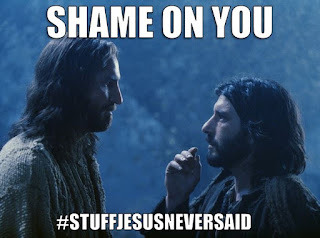 Shame is the tool the enemy equips traditional religion with. Tradition can only show how you are always failing and how you need to continually improve. Grace says otherwise. The Finished Work reveals your infinite value to your Father in Heaven. Under Grace God says you're more than a conqueror. That Christ has made you accepted and approved. Not religious approved but Jesus approved! Even when you fail, Grace reminds you of who you are. You're the righteousness of God in Christ, free from condemnation and no one is able to lay a charge against you. In summation be free from the religious tradition of men and embrace what Grace says about you. When they say you are failing to measure up, rest knowing Jesus already measures up and He says you're approved. When they say you're letting God down, remember you're not holding Him up, so you can never let Him down. Rest knowing Jesus is the complete shame remover. Embracing Grace brings us to a place of rest free from shame and condemnation.